In fact, Nicaragua’s headed in the opposite direction. As The Washington Post was quick to point out, Nicaragua hadn’t signed the accords because it found the climate standards not strict enough. The Paris accords wouldn’t be putting enough pressure on wealthy nations to make sacrifices, according to Paul Oquist, head of the Nicaraguan delegation in Paris. “The only way you can get that reduction is out of the big emitters,” Oquist told Climate Home’s Alex Pashley, referring to the 2-degree Celsius reduction goal (of global average temperatures) the accord has set to mitigate the effects of climate change. Nicaragua has been putting its money where its mouth is for years. For over a decade, the country has invested in its renewable energy sector, mostly as a way to wean itself off of expensive oil imports. Its 2005 “Promotion of Electricity Generation with Renewable Resources” law, for example, gave tax breaks to private companies building renewable energy generation facilities. Its strategic renewables plan is a national priority. And it’s paid off. 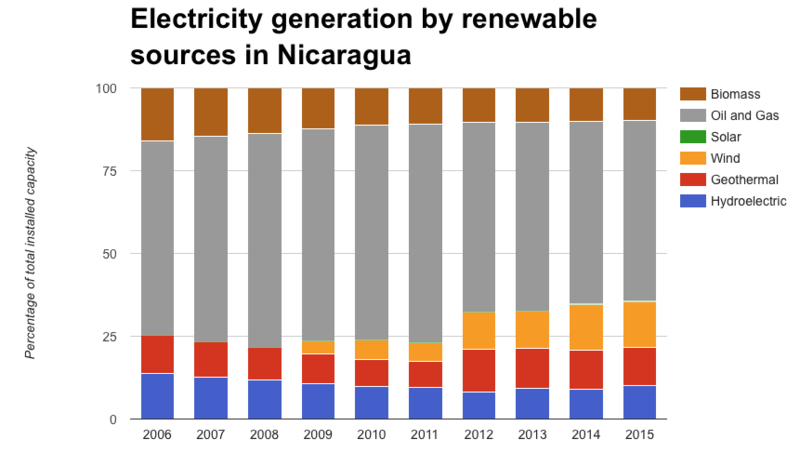 Since 2006, wind energy has grown from zero to just under 14 percent of Nicaragua’s total electricity mix, according to the Nicaraguan Energy Institute. Hydroelectric and geothermal power make up an additional 10 and 11 percent, respectively, meaning one-third of Nicaragua’s electricity is generated through renewable sources. Add in biomass – itself questionably renewable – and you’re almost at 50 percent. By 2020, the government hopes to grow that to 90 percent. 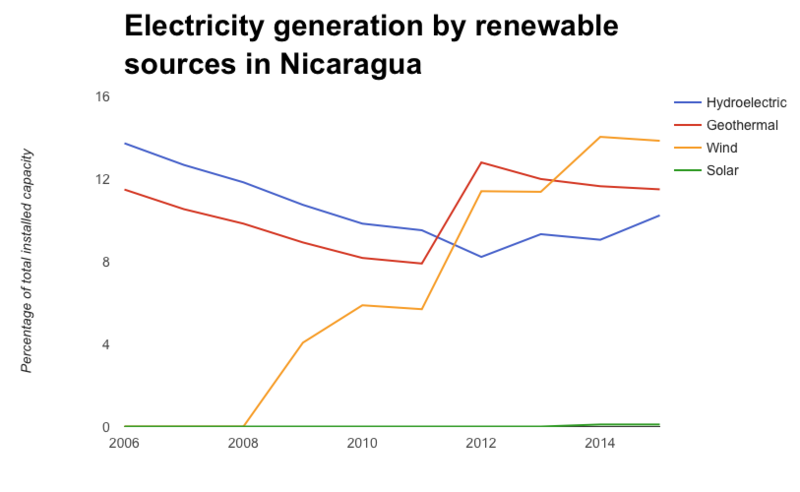 For a country its size –whether you’re looking at area, population or GDP – Nicaragua is an interesting case study for renewable energy growth which demands more attention. Some have called it a revolution. Others, a radical shift. Still, problems abound. Around a quarter of Nicaraguans still lack access to electricity. Blackouts are still common. But there’s room for growth in renewables. Solar is still negligible in the energy mix and Nicaragua recently sent an envoy to court investors in Spain. Geothermal may continue to heat up. 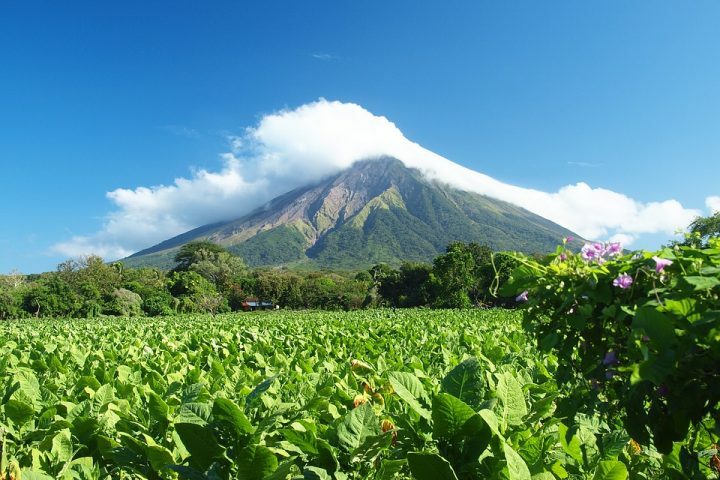 After all, Nicaragua has 19 piping hot volcanoes, many of them untapped. Photo: Creative Commons via Pixabay.